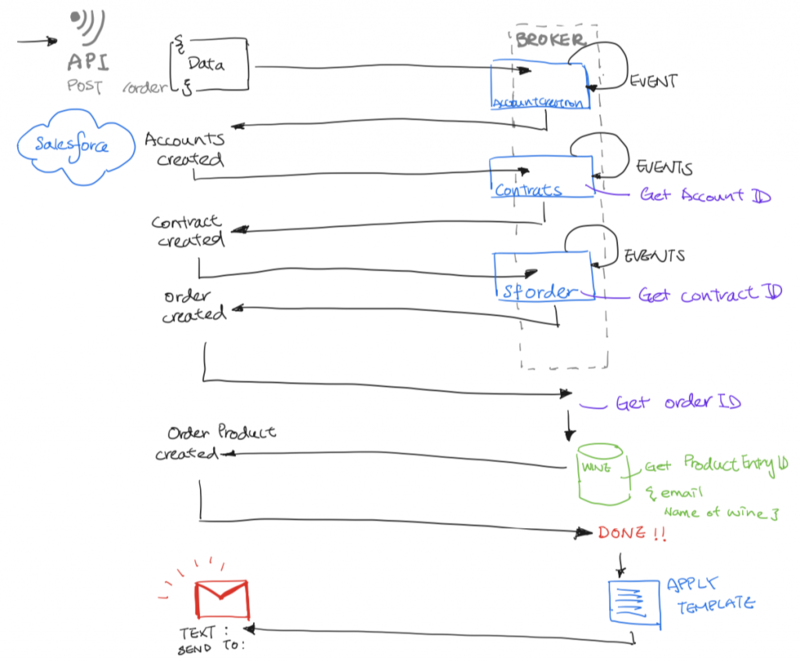 If you would like to know how the API is built and implemented, please check the first article. In this article, I will be focusing on how to integrate with Salesforce using an event-driven approach. Creating an order in Salesforce requires many steps. The first is to set up an account for every user and define the contract of each user. After that, we are ready to create the order, but the details of the order need to be handled separately to associate it with price book entries. Each step I describe requires the output of previous steps. So we should build our application in an asynchronous way to avoid long-hanging processes. To set up for the event-driven system, we need a medium of some sort to hold and distribute the events; it could be a messaging broker or a streaming platform. Here, I will just use a broker for the sake of simplicity. 2. Wait for incoming request and create an account in Salesforce with the username. 3. Wait for successful account creation and then create a contract in Salesforce using the account ID. 4. 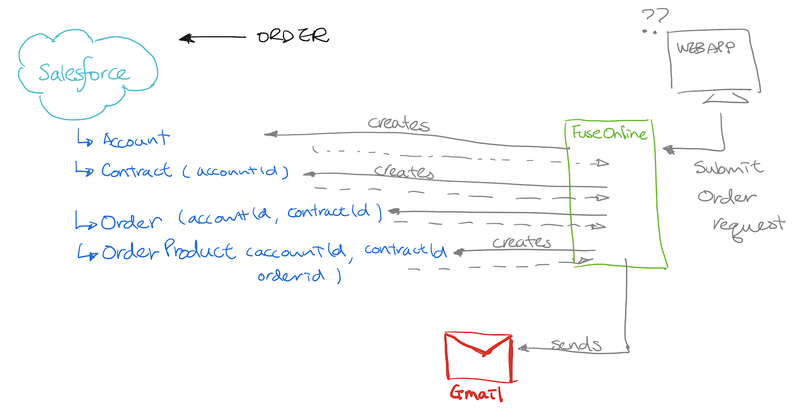 Wait for successful contract creation and then create an order using both the account ID and the contract ID. So if we implement this event-driven integration solution, we will have five perfectly modularized integration microservices running and ready to handle the events, as shown in the following diagram. In addition to placing the order in Salesforce, we also want to notify the customer via email when the order is done. A template can be used in Red Hat Fuse Online to make sure the format of the email is consistent. To apply the data from the integration solution into the template, we can use the placeholder along with static boilerplate text for the email. Watch this video to see how I created the integration solution. And here is the link to my repo that contains everything you need to re-create the demo.